Christine Evans’s You Are Dead. You Are Here. isn’t so much a war play (or an anti-war play or even a post-war play, for that matter) but a war-torn work of restorative narrative. 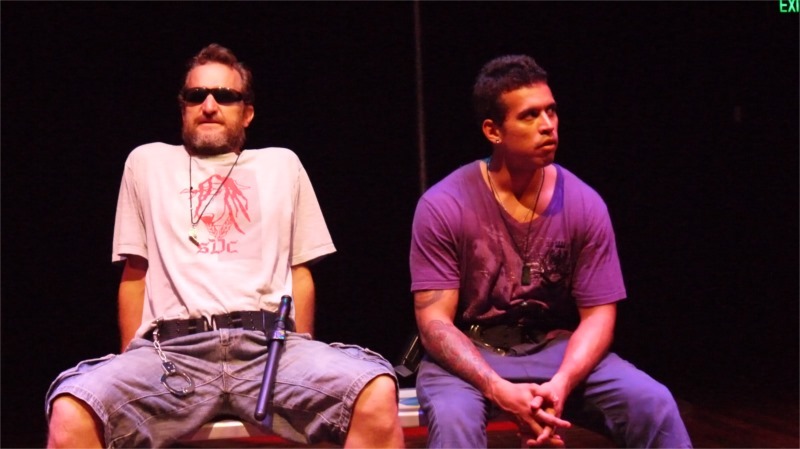 Set in the present day in a war veterans’recovery center, the tech-designed play starts off as a series of therapy sessions. Soon it morphs into an immersive virtual-reality world that, in turn, opens a striking window onto the psychological suffering of soldiers and the nightmarish plight of war’s innocent victims. It’s about an Iraq soldier who struggles to reclaim some semblance of normalcy in his civilian life, and about the intrusion into his scarred psyche of a teenaged Iraqi girl who demands to return to the world. It’s an ingeniously designed drama about post-traumatic stress disorder (PTSD)—deliberately constructed to exhibit the healing virtues of a simulation program that has been used by the U.S. Department of Defense to help Iraq veterans suffering from PTSD. A work-obsessed therapist, Dr. Hannah, and an American war veteran, Michael, meet for weekly exposure treatment sessions. She successfully persuades him to agree to participate in this experimental technique: a new clinical tool called Virtual Iraq, a virtual-reality program originally developed for military training that has been adapted to help in the treatment and rehabilitation of PTSD. A software app modeled after video gaming systems, Virtual Iraq simulates battlefield experiences. With the help of a therapist who adds and subtracts to the game-like simulation, war veterans share real-life experiences to produce traumatic scenarios. It’s not about re-enacting revenge fantasies. 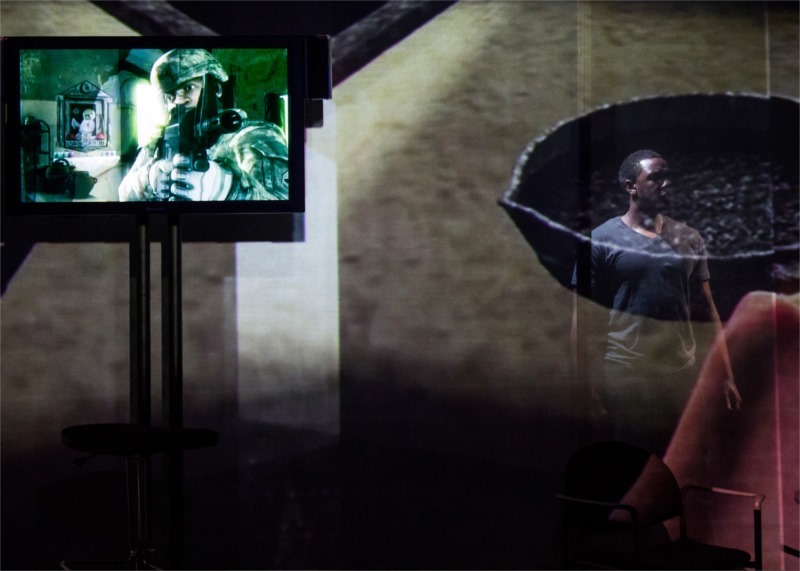 Although it might at first look like a war-based video game, it allows soldiers (and by extension, the audience) to visualize and relive the traumatic events they experienced during the two U.S.-Iraq wars and the U.S. war in Afghanistan. The larger intention is to try to heal their emotional scars and re-adjust to living a normal life. What is thought-provoking and affecting about You Are Dead. You Are Here. is how sensitively all of a piece it is. Evans’s compassionate view of her lost characters, Megel’s careful visual orchestration of the recuperative drama’s unfolding, Mezzocchi’s brilliantly resonant media design, and the eloquent performances of actors Anthony Gaskins, Kathleen Khavari and Kittson O’Neill—all of it that calls provocative attention to the production’s artifice, even as it seamlessly intertwines the virtual and real worlds, the past and present, the live actors and projected bodies, as well as the traumatized survivors and the ghosts that haunt them. 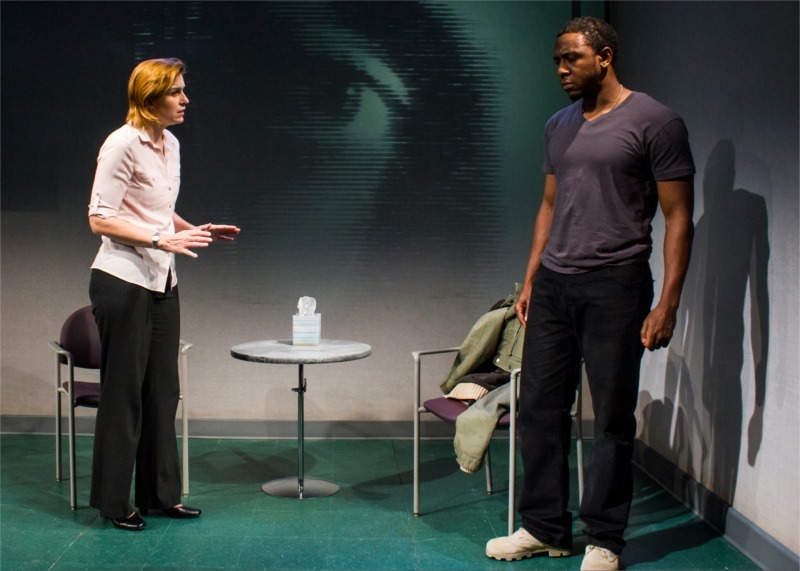 In the play, Michael re-experiences his buried memories of the Iraq War. One of those scenes living below the surface of his psyche involves watching “death in the rear view mirror” when his buddy gets blown to pieces by a roadside bomb while on patrol in a Humvee. Through the course of his clinical exploration of Virtual Iraq, however, the ghost of Zaynab, an Iraqi teenage girl blogger who lives in Fallujah, invades his conscience. 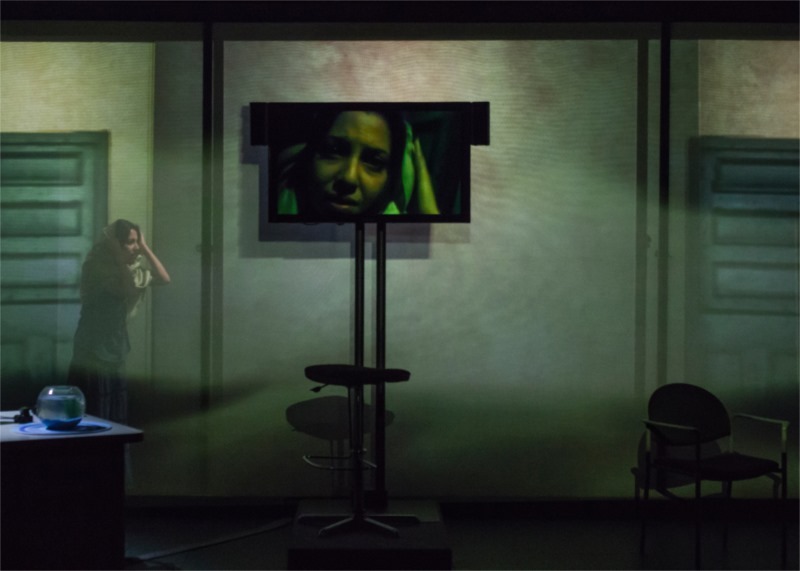 While he is undergoing treatment, episodes of Zaynab’s story explode onto the VR screen and are projected onto the therapist’s office’s walls (the appropriately clinical set design is by Melpomene Katakalos). As audience members, we are permitted to hear Zaynab’s life in the war: the lack of water and food, the intermittent electricity, nine family members crammed into a small apartment including a crying baby, the finding of the head of her brother’s friend in the garbage, the death of her mother by an American combat soldier, and so forth. Zaynab’s intervention gives a face to the days leading up to Operation Vigilant Resolve, a massive assault on Fallujah that resulted in the death of hundreds of Iraqi civilians in 2004. Her nightmarish story opens up a gateway into the alternate political reality of “the other”—those faceless ordinary Iraqi civilians whose real-life stories are frequently never told on television’s nightly news. This is not about offering an all-inclusive perspective about war. Zaynab’s insistent intrusions into Michael’s fragile memories effect a theatrical overlapping. They are the very tech-driven form and haunting content of this performatively designed drama. In Trojan Barbie: A Car-Crash Encounter with Euripides’s Trojan Women, Christine Evans transposed Euripides’s ancient drama to produce her sense of our post-modern disconnection with war. She was interested in colliding world, clashing cultures and multiplicity of international perspectives. That’s true here as well in You Are Dead. You Are Here. Zaynab’s active intrusions into the play are knocks on the door of the war-mongering American conscience. They are a kind of Internet hacking into the media-trained disappearance of other perspectives from the world map of politics, news and everyday presence. As in Trojan Barbie, You Are Dead. You Are Here. re-introduces the dead to honor the atrocities—to account for the human toll and loss—that happen on all sides. In a profound respect, You Are Dead. You Are Here. proves the inherent fantasy in Peter Davis’s description of Christine Evans’s war plays as “postwar plays.” The prefix “post” assumes that warends. It assumes that our human instinct for war dies, and we can just move into a new phase. This is just not so. War never ceases. There is no such a thing as a “post” to war. There can only ever be more wars. In You Are Dead. You Are Here., Evans dramatizes the consuming impact of war in the age of global media. In a software program, a soldier’s memories populate a digitally animated landscape where figures and objects seem so real until they later cleanly vanish from a computer screen. In an actual war, physical wounds and psychic scars leave unimaginable traces on the body, on the soul, on society and on history in unbidden and often terrible ways. Theatre is its own virtual reality game: a made-up hybrid space, for emotional clashes, for painful reckonings and for encounters between the living and the dead. Inside a theatre, we are reminded that war is a cycle that repeats. As soon as one war “ends,” even those survivors who manage to return home are compelled to face fresh conflicts in other war plays. RANDY GENER: In your country/city, is there any major issue (e.g. a contemporary social problem) that artists fail or neglect to address on stage? Why? CHRISTINE EVANS: This is a hard one. I’ve only been in DC for a little over a year, so I’m still learning the landscape. That said—there seems to be a great flowering of smaller companies here, with the Capital Fringe a major driver, and the work there seems incredibly diverse. I can observe that some of the well-noted blind spots and omissions in the national theatre picture also pertain here. Women, black and Latino/a artists (some of these categories overlap of course) are under-represented as writers, directors and play protagonists (with some shining exceptions.) The higher up the money tree you go, the truer this tends to be. 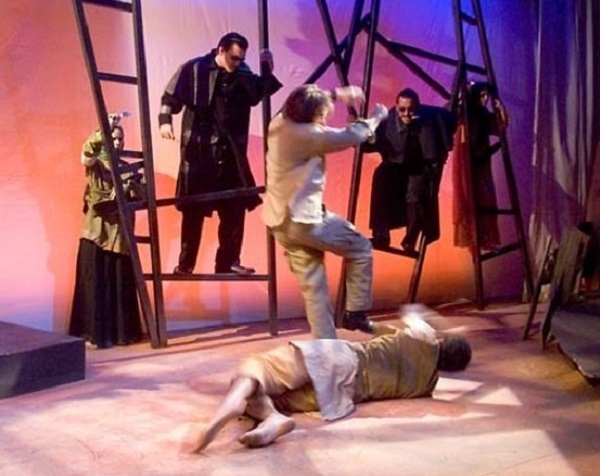 My favorite DC show since arriving was the German playwright Roland Schimmelpfennig’s The Golden Dragon at the Studio Theatre, and I was taken aback to learn that this work was not lauded overall. I think this is to do with a lack of familiarity with non-realist aesthetics (eg. post-Brechtian theatre) and the political critiques of hegemony that are historically associated with them. We are in a moment of stage realism as the dominant trope in the regional theatre—Morgan Jenness calls it “theatre for the oligarchy”—at a time when ensembles and independent companies are doing far more aesthetically experimental work. The split in sensibility and income between the theatres with buildings and subscribers and funding, and those lurching from show to show, seems to have widened in some ways, and this reflects what’s happening to the country as a whole—economic inequity has increased hugely since the 2007 crash, accelerating a trend in place since the 1980’s. The world looks really different depending on your place in it—food stamps queue or corporate HQ—and those divisions have grown much starker. Is this due to censorship, or to a blind spot in the community’s shared perception of the world—or to a community’s consciously or un-consciously avoiding it? I do think there are blind spots—internationalism; aesthetic variation; a wider worldview than that which takes the white middle-class family as normative. There’s also a strange requirement for “hope” and “uplifting endings” and a lack of serious political critique, which is amazing considering that we’ve just lived through the largest mass transfer of wealth from poorer to richer people since the Great Depression. For instance Lucy Preeble’s play Enron was a hit in London but received a lukewarm reception here. 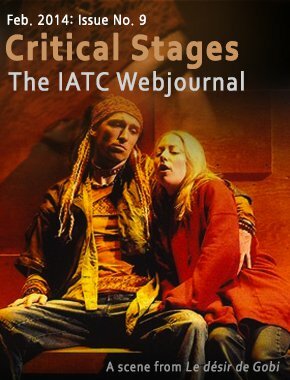 As Mac Wellman wrote in the 1990’s, “Perhaps there are no liars or recidivists on our stages because we are ruled by them and are blind to their doings.” We lack a sustained critique that accounts for socio-economic class, and our theatres reflect on their stages the way that they are structured (and led) as organizations. Yet for me, the question is not so much to do with what issues are or are not reflected on stage, but the ways in which the theatre functions (in playwright Lauren Gunderson’s great phrase) as a lens, not a mirror. The dominant U.S. lens is focused tightly inward and (with significant exceptions) values the illusion of mimetic clarity over various other filters. Individualism itself is undergoing radical transformation, as the hive mind gains real power—so “hero’s journey” plays may soon be dinosaurs. And global warming will change everything we take for granted about our relationship to nature, technology and the future. These are changes and problems that require a radically reinvented theatre on every level, from the places it happens in, to the ways it imagines and perhaps co-authors events with its audience, to the scale and scope of the stories it tells. What, if anything, is difficult in communicating with designers/directors/actors/playwrights? Why? How early and how often do you exchange views about the coming production? Could you describe the initial phase of your work method? In answering this question, would you please focus specifically on your production of You Are Dead. You Are Here. Working on this show was really a joy for me, and I’m still mulling over the ways it’s changed what I want to do in the theatre. It began life in 2009 as a tiny commission from director Joseph Megel, who was putting together a theatrical component for a festival at University of North Carolina Chapel Hill (the Collaborations in Humanities and Technology—CHAT Festival). 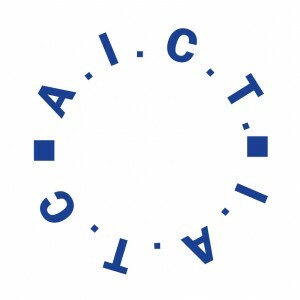 Joseph asked five writers to create short scripts that incorporated video gaming, which commercial video-game design company Icarus would then design. The scripts would then be woven together in live-virtual performance event, the Performance Factory. I loved the challenge, and the question for me was, “Why does it HAVE to have video?” I wanted to write something where the video-game element was essential, rather than decorative. When I discovered the military uses of video-game technologies for both training and rehabilitating soldiers for/ from war, I knew I’d discovered my subject. From that first short script (which changed completely in building a full-length piece), Joseph and I knew we’d found something very powerful—it really touched a chord in audiences—and we committed to continue working together on it. Shortly after that, by complete chance, I met Jared Mezzocchi, and intuitively knew that he was the right person to complete our project. Our work process began from a small seed, and was artist-centered from the very beginning. We committed to build a full-length work and then sought ways and means. The best creative results I have ever had in the theatre have followed that path—beginning with the artists and the seed, and working outwards from there, sometimes for years, to production. We stayed in fairly frequent touch, and came together for intensive periods of workshop and residency when we could do so. I’m very grateful to the ART’s graduate program, UNC Chapel Hill and Georgetown’s Davis Center for the Performing Arts for serially hosting us. Significantly, these earlier opportunities came through universities, not from theatres, which are not well set up overall to support open-ended experiment and see work through over several years. Our residency at HERE Arts Center, which does partner with artists long-term, was a major game changer for us—it meant a great deal. The practical side was absolutely the hardest. Joseph, Jared and I lived in different U.S. states for most of the process, so building our own structure and external partnerships in the midst of incredibly busy lives with full-time jobs (Jared and I both got new jobs and moved cities in the process) was hard work. Gaining an artists’ residency at HERE in NYC was a huge boost, as was connecting with Skip Rizzo, the inventor of Virtual Iraq, who’s been a generous and amazing partner at every level. We also had the most stellar dramaturge and outreach coordinator, Heidi Nelson, who was a superb team member; and we worked with our lead actor, Anthony Gaskins, since the very early days of the project. 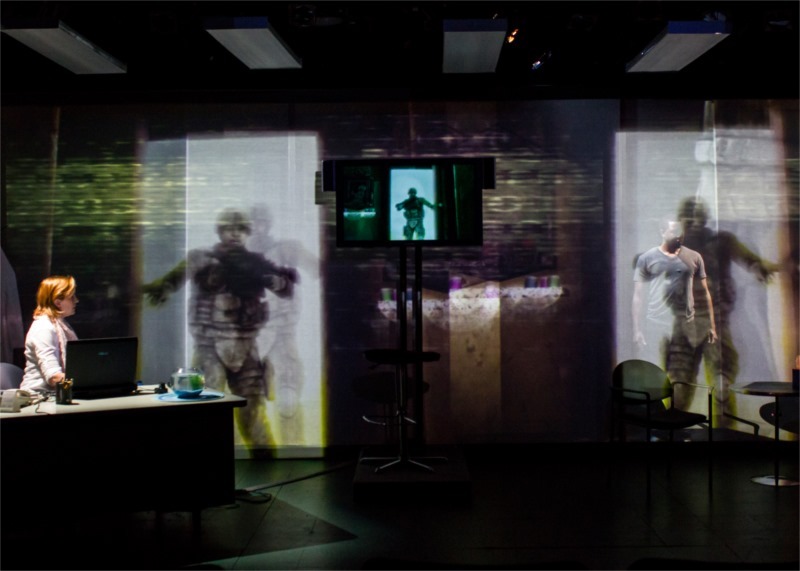 I am very proud of what we managed, considering that we were inventing everything about the piece—it’s the world’s first show to adapt Virtual Iraq for the stage—as well as partnering with people outside the theatre. The missing link which we still have to solve, is the producing engine of the work. Since we wanted autonomy and had chosen ourselves as the team, we could not rely on a theatre to just pick up the script and hire artists. Going into production was a steep, steep learning curve, because we needed to do a lot of the producing side, in partnership with HERE, and for none of us was it our forte. It was hard to suddenly incorporate other artists into a “gig” after the three of us had worked together for so long. It took us a bit of time to click into our roles, and hand over full power to each other’s roles. We had powerful responses from audiences, ranging from regular New York downtown theatregoers to veterans and military therapists. In retrospect, we needed a dedicated producer on board with us right from the start to really make the most of that potential, get the word out early about the show, and also help audiences grasp the context and technology driving the show. This piece has powerful potential for future life, and we really need to figure out how to partner with a producer as an integral team member to make that happen. We are working on it, and I hope to have exciting news on that front soon. Have you designed shows yourself, and if so, does that make communication easier? In my early creative life in Australia, I worked primarily as a musician, playing in bands and shows, then as music director in theatre. Sometimes I wrote and directed the music to shows I’d written. I worked at levels from major regional houses to tiny black-box theatres and pubs, and this experience was absolutely invaluable, not just in grasping what designers do, but in how I write. I think about space, music, rhythm and image and write those elements into my plays. In your creative process, which part do you enjoy least? Why? How do you tackle it? I find the practical, producing/ self-promoting part absolutely the hardest. Since we needed to come up with a chunk of our own budget, I found the fundraising while rehearsing the most grueling. As a playwright, I find that moment of “handing over” really hard, and with You Are Dead. You Are Here. that was additionally tricky, because, as I said, the three core artists were so bonded that stepping into our specialties (and stepping back from others) was less intuitive than usual. I’d worked so closely and joyfully with Jared on the visual language of the script—since commands from Virtual Iraq are literally part of the play—that it was hard to sit back and let the designers put up this incredibly complex show and realize I had to let go at some point so they could do their work and show it to us. In general, I have a grieving period when a show is in previews. Firstly, it always seems impossible that we will get there; and secondly, it’s the moment when the play stops being a whole world in my mind, where I have lived for years, and begins to be born as a finite, separate creature—a play on stage. So there’s that hard moment—and then I can embrace the newly created production, which is no longer the world in my head but its own, unique, living, breathing being. I grieve, I let go, and then (in good productions) I fall in love again. Where do you situate your plays in New York City? Where do you situate your work within an international context? How do you see yourself in relation to other practitioners? Hmmm. These questions are in deep flux for me right now. I don’t know about New York. There are audiences there for my plays, for sure—and certainly, artists working there that I love and want to work with—but since I live outside of the city, unless I find a miracle home base there like New Dramatists, it’s hard to find my place. The work of a NYC playwright seems to be hugely about showing up, knowing the scene, and being part of a community, and I just can’t do that in the way that I could if I lived there. Ironically, I think I need to go away from New York, go away from the idea of pushing in towards the center, and really focus on my own hybrid particularity. The work always comes first, and if I trust that, and find partners from there, then the joy of it and the creative process are always much better. Whether or not that turns into prestigious productions is another matter, and one I can’t really control. Internationally—I just had two shows in Australia, and visited for one of them. I have started a new creative project with an Australian director, a long-term collaborator and dear friend. We are starting a new bi-national company, Ghost Logic, that builds work in Australia and the U.S. and then partners with local and international organizations towards production in both countries. Technology has made it much easier to move between long-distance and “on the ground” work with others, and I’m excited to invent smart ways to work at distance and still create embodied performance. It’s time for me to come out as an immigrant in the U.S. and to reclaim my Australian roots and voice. It’s hard to do in a country that’s so focused on American stories—yet immigrant vision and energy is absolutely a part of that. Since my origins don’t line up with the major immigrant groups here, I tend to disappear into a sort of generic whiteness—but as I will never be writing American family dramas, I might as well be bolder about who I am and what I care about on stage. In your work, where do characters come from? God knows. They just sort of stroll in. I usually start with an image, or a problem, or a moment that puzzles me, and it starts from there. Often I feel that I need to offer my unconscious mind a premise and then…wait…until it responds. Then I get my start, and can write into it. 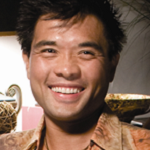 For instance, I wanted to write a play set in an Australian immigration detention center. I was sickened by what was happening to refugees in my country and wanted to write about it but had no idea how to begin. I knew I did not want to write a documentary play. As I was falling asleep one night, the line came to me, “The day burns black / The night’s a slow falling bird.” From there I saw the image of a half-bird, half-woman, caught on a wire fence, stranded between earth and sky…. and that character, the play title (Slow Falling Bird) and then the rest of the play grew from that seed. Who and what have acted as influences on you or your work? Music—playing in bands; learning Balkan music. Changing countries three times as a child. Reading tons of fiction as a child. In terms of theatre: the Australian dramaturge Keith Gallasch. Circus Oz and the Australian physical theatre movement. Caryl Churchill. Mac Wellman. 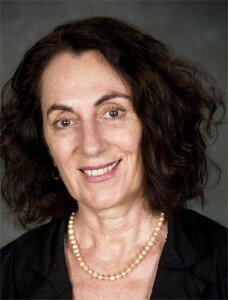 Maria Irene Fornes. My teachers Nilo Cruz and Paula Vogel. Suzan-Lori Parks. W. David Hancock’s astonishing take on naturalism. The Greeks, especially Euripides. Is there one play or production that you think you’ve learned the most from? What did you learn? My Vicious Angel. Produced in the late 1990s in Australia, it changed my work in the theatre from a performer/musician/music director, who wrote secretly in her journal, to playwriting. I worked with dramaturg Keith Gallasch on this play for a couple of years, and in that time it grew from a tone-poem with music to a full theatre piece. I learned so much from him about dramatic structure, about growing a play from impulse to completion. Then I worked with director Rosalba Clemente (still a dear collaborator) on its world premiere. I also wrote and directed the music for that show, so I was really involved on every level. It went on to production at Belvoir St. Theatre in Sydney and returned to Adelaide for the International Festival of the Arts. I learned that you need to respect the seed of the work, first and foremost, and let it grow like a crystal from the inside out. That structure needs to be organic to the work. And that who you work with, if you write this way, will absolutely shape the outcome (for good or bad) in a way that’s less true if you write sturdy, bomb-proof plays with well-known structures that line up with conventions of actor training and short rehearsal periods. How does the American theater look from your perspective? Would you still be an artist if you had to start out today? U.S. theatre overall seems insular to me, confoundingly obsessed with “American stories” and heavily slanted towards variations of the family drama as metaphor for everything else. It is shattering to me that (for instance) there’s not more consideration of the lives of Iraqis in the wake of the U.S. war. In researching and writing You Are Dead. You Are Here., I came across many works focusing on the U.S. military experience of Iraq but very few that considered the other side (Aftermath being one)—and the only other play I know of that has both Iraqi and international points of view in it is Canadian Judith Thompson’s Palace of The End. As to whether I’d still be an artist—yes, yes, yes. I might be a different kind of artist, but writing would still be core. It just isn’t possible for me to thrive (or others to put up with me) unless I’m writing. In the impossible event that a younger me would learn something from current me—I would be bolder, quicker to give up on pleasing others, and be more patient and committed about my own practice. I would trust that finding creative connection with others was the true key to joy and successful work, and pursue that rather than trying to fit into pre-determined slots. I would not ask “What do they think of me?” about theatres and people, but instead ask myself, “What do I think of them?” and let that guide my choices. Above all, I would cultivate a practice that put doing the work first, last, and in the middle, no matter what—in a simple way, every day. Tell me something about your biography. Why or how did you become a theater artist? What was the impetus? How have you changed as an artist from the first time you had wanted to become one to what you are now today? My true north is writing, and that I happen to be a playwright is an accident of my biography. I was born in the U.K. to expatriate Australian parents and moved at 7 to New Zealand, and at 10 to Perth, Western Australia, where I grew up. As a small child, I’d run away from school regularly trying to find Never-Never Land, which (at 4 and 5) I believed in. I wanted to live in a world of imagination so much more than in the real one. I was a dreamy child, and it was hard to live in an organized, rule-bound world. As I grew up, changing environments taught me early that what seems cast in stone in one place is different in another. I always felt on the outside—perhaps most writers do—and this tied to a visceral grasp of cultural relativity, and the impulse to bridge worlds. I have never understood nationalism, or even belonging to sports teams, really. I wrote my first novel at the age of 9, and am still very drawn to writing fiction. After school, which I finished at 16, I drifted around in share houses and the like until friends joined a circus. So I got into indie performance, and then into music, through grass-roots theatre, and that became my life (with training along the way) for many years. This by the way, was possible in Australia, because we have socialized medicine and a generous safety net—I don’t know what I’d have done here in those early years. My first serious boyfriend was a musician, and a lovely fellow who encouraged me to play music, and we traveled through Europe and Australia and played together, and with others in bands. I began a long relationship with the Balkans through that musical connection. If I’d fallen in with (say) horse-breakers in my late teens, everything might have been different. As to how I have changed, I think the nine-year old who wrote that novel is still the core me, and after a long circuitous journey, I’m now returning to fiction. I think we grow like rings on a tree—outward, but not radically changing shape. 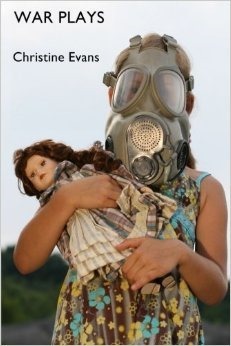 “War Plays” by Christine Evans, published by NoPassport Press. Tell me something about your book War Plays from NoPassport Press. It collects three plays: Trojan Barbie,Mothergun and Slow Falling Bird. Would you say these are anti-war plays or neutral about the war? Do they represent a style? Do they represent a period of your life, from which you have moved on? As I look back, the relationship of these plays to war themes is clear. However, it was not at the time: they were written in very different circumstances. Mothergun, the earliest, was written before 9/11 and just as I was moving to the U.S. It was a “boot-camp” play for Paula Vogel’s introductory session in the MFA at Brown, which I was about to begin, thanks to an Australian Fulbright award, as that program’s first international student. I’d recently met artists from Serbia’s Dah Teatar and, inspired by their work, had been contemplating the role of art in confronting war—and of course was horrified by what had happened in Bosnia. That play has a musical and poetic tone; it shows the influence of English writers I admire (Churchill, Bond, Pinter and Kane). It ends with a hard-won image of beauty in the midst of betrayal, which was really all I could salvage from the bleakness of its story-line. Trojan Barbie, like You Are Dead. You Are Here., was initially written in response to a small commission from Roberto Gutiérrez Varea to adapt Trojan Women for a large student cast at University of San Francisco, working in collaboration with ¡El Teatro Jornalero!, an immigrant day-laborer’s theater. I read a lot of Euripides in preparation, and was struck by how much the famous characters in his plays functioned as pliable masks. They changed a great deal from play to play—so character functions as template for certain energies or qualities. I was also struck by how Euripides set his play in a distant time in order to comment sharply on his own country’s contemporary war-making. I worked on this play with Roberto and his students in 2003-2004, right when the Iraq war was happening. The collision of current events with this ancient play gave me a way in to re-imagine it; I was so struck by the disconnection between the way the war was being mediated and sold to us, and the likely reality on the ground, that the gap between those two experiences became central to the play. The first version was huge and unwieldy (then called The Doll Hospital). I reworked it later for a less enormous cast, re-titled it Trojan Barbie, and the American Repertory Theatre in Cambridge, Mass., premiered it in 2009. Slow Falling Bird was written from the U.S. in response to harsh Australian government policies and populist demonization that resulted in the cruel treatment of asylum seekers coming to Australia, many of them fleeing Iraq, Iran and Afghanistan. It is a play that like the others, has a poetic dimension; it has a much stronger sense than the other two plays of landscape; of the dreams, fears, fantasies and longings that infuse the dry continent of Australia and play out politically. It is written in the gap between white colonial culture, indigenous displacement and the recent arrivals who spark populist fears of being “flooded” by immigrants. I feel the bones and mythic structures underlying Australian life and land in a way I don’t yet in the US. So it’s true that all three of these plays respond to war or its fall-out; what they have in common is an attempt to connect the experience of war to the fears, fantasies, dreams and hidden violence that underlie it and make it possible. I don’t think they are “anti-war” plays in any simple sense, because in a rational world, everyone is anti-war; the question is rather, how can these things happen? Is there a connection or continuum from historical violence—often buried—and contemporary war? Wars don’t happen without the imaginary life of the initiating country (or force) somehow being co-opted into their pursuit—or at least complicit in it. What are your plans for the future? Goals? Productions? Career dreams? Fantasies? In 2012, I joined the faculty at Georgetown University’s Theater and Performance Studies program. I have been busy getting established in my new city and my new job. Georgetown will provide exciting opportunities to build international bridges and connect the creative and critical work I do, but it will take me some time to figure out the best ways to do this in collaboration with my colleagues, and while managing the demands of teaching and the tenure process. Last year was a very busy one with multiple productions (several Trojan Barbie’s; Slow Falling Bird; You Are Dead. You Are Here.) I feel the need to regroup, to go inwards after such a hectic time, and spend time in the privacy of writing again. I do have plans for a bi-national company with my dear Australian collaborator, Rosalba Clemente; and I’m working on a new piece, Cloudless, set in Western Australia during the 1980s. Joseph, Jared and I are pursuing future production and touring for You Are Dead. You Are Here. as well. My long-term dream is to work with committed collaborators to build work over time, and have this work tour internationally. I am now writing fiction, and returning to that brings me much joy. During your career, have you ever received a particularly insightful piece of criticism? When, and what did it say? What made it especially important for you? I have two examples: one from a positive review; the other from a negative comment in an otherwise reasonably good review. What stood out to me about this—especially in relation to other U.S. reviews of my plays over the years—is that this reviewer grasped the larger picture and critique implicit in the play. I do think there’s an American blind spot about other countries and cultures, and it’s hard for Americans to see themselves through the eyes of others. 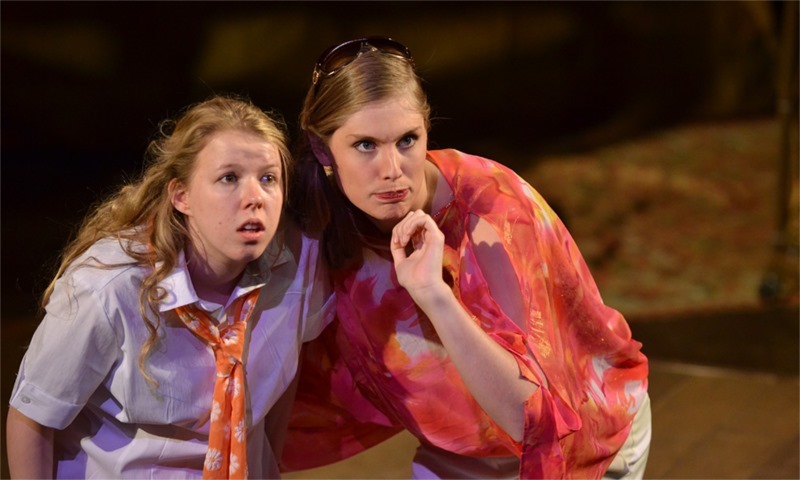 Now the negative comment: “Evans tries to tell too many stories, and so dilutes the focus of her play.” This was about Slow Falling Bird, and for me it points to a comment, or kind of comment, I have heard more than once. It shows the expectation that a good play is driven by a single protagonist, fulfilling a traditional dramatic arc. My writing is more polyphonic and the landscape, or world itself, tends to be a character or at least, a defining force, in the play. I did think about whether I was trying to tell too many stories, and decided that what I was interested in was the weave of multiple lives. David Edgar notes that women more often than men seem to write outside of a realist, protagonist drive aesthetic—I’m not sure if that’s true. But I do think there is a connection between narrative form and hegemony; well-made plays with male protagonists are the “correct” stories for our culture because they reinforce its values. This comment taught me that I need to figure out how to invite audiences into the aesthetic of the play, so that my plays are not judged by rules irrelevant to their structure.